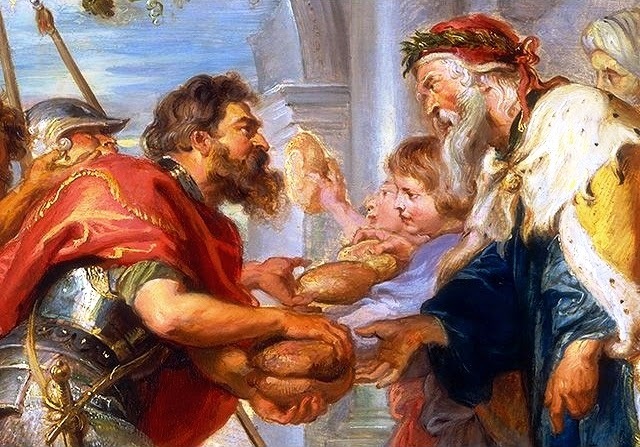 Does Abraham's tithe to Melchizedek mean we must tithe? When Abram heard that his relative had been taken captive, he called out the 318 trained men born in his household and went in pursuit as far as Dan. During the night Abram divided his men to attack them and he routed them, pursuing them as far as Hobah, north of Damascus. He recovered all the goods and brought back his relative Lot and his possessions, together with the women and the other people. But he tithed only once. One time only, Abraham gave 10% of the spoils of one war to Melchizedek, while he gave 90% to the kings of Sodom & Gomorrah. He never tithed from any other source, either before or after that day. * Does this mean that we should tithe on the spoils of our war? Do we get the Pentagon involved in this, or do we limit ourselves just to wars that we ourselves lead? Are we limited only to foreign wars, or does a fight with my wife count? * Does this mean that we tithe after we kill people? If so, whom shall we kill on Sunday morning? Abe killed people who held his family captive. Who would that be today? * Does this mean that we should tithe when a priest brings bread and wine to our workplace and blesses us (as Melchizedek did here)? In that case, I should tithe to the traveling sales reps, I suppose. They bring food to my workplace, though they’re not really priests. * Does this mean we should tithe only one day in our lives, as Abraham did? If so, how do we choose which one day we should tithe? Should it be when we’re young and strong, or when we’re old and wise? And should it be a work day, or a weekend day? If it only happens once, we should be careful to pick the right day. My point is this: it is foolishly disingenuous to say, “You must apply this one detail out of this story, but ignore all the rest of it!” That’s religious manipulation at its worst! It is completely unworthy of the People of God. Conclusion: This story is clearly not appropriate to use as a tool to demand that people give you 10% of their income. But don’t take this too far. I am not trying to say, “Do not tithe!” Nor am I saying, “Don’t be generous!” as some mistakenly say. I’m saying that the People of God are not subject to the extortion that the tithe teaching has become: “If you don’t obey this Law, you’re a lousy Christian!” Many churches today deny members opportunities to serve, or to receive ministry, unless they’ve submitted to the extortion. Christians are not under law. We are not required to tithe. However, note that the law of sowing and reaping is part of our lives in the New Covenant. Consider 2Corinthians 9:6: “Remember this: Whoever sows sparingly will also reap sparingly, and whoever sows generously will also reap generously.” That's for us. That’s real. And the need for believers to be characterized by generosity, particularly to the poor, is incontrovertible! Really, 10% is a pretty wimpy standard for people who have generosity in their soul. Giving from a free heart is completely encouraged! And we’re free to give where we want to: to missions, to local congregations, to a benevolence group, directly to needy people, or to a secular group that does worthy things. And we’re free to donate money, or time, or sweat, or influence, or anything else we have to give. So, if people read the story of Abraham and Melchizedek and then they say, “Well that proves it. I must give 10% of my income to you every week because Abraham gave 10% to a priest one time!” then somebody is not thinking clearly. That’s just the spirit of stupid. But if they read the story of Abraham and Melchizedek and then they say “That’s cool! I want to do that!” then more power to them! That’s a beautiful thing! Just don’t try to make it a law. That would be a lie. And it’s not good to lie to the people of God. sure glad to hear you say this!! i totally agree, and it's not common to hear others, especially leaders agree with this...it's sad that they teach this way and steer the sheep away from the truth (and i'm no scholar but even i figured this one out)...honestly it took revelation on my end (thanks to the HS)...i'm not good with theology, so the Spirit was my guide and i till this day follow His lead...thanks for your honesty, it sure makes for a nice day to hear there are people out there who aren't afraid to speak truth...wtg! !